It rains also in this morning. It's like cats and dogs. 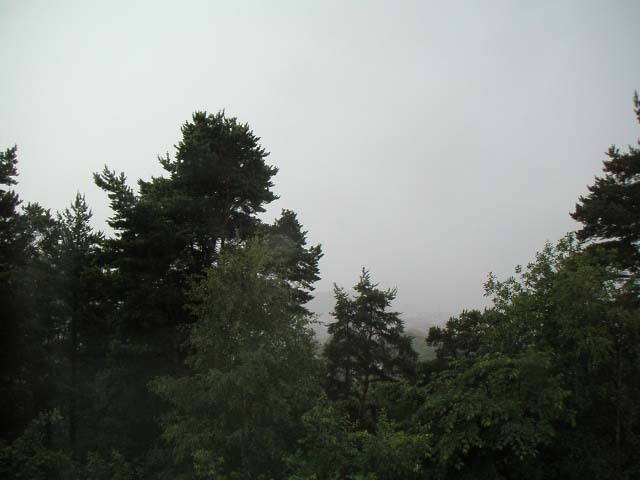 The temperature is 19 centigrade. I can not see far away because of the rain. 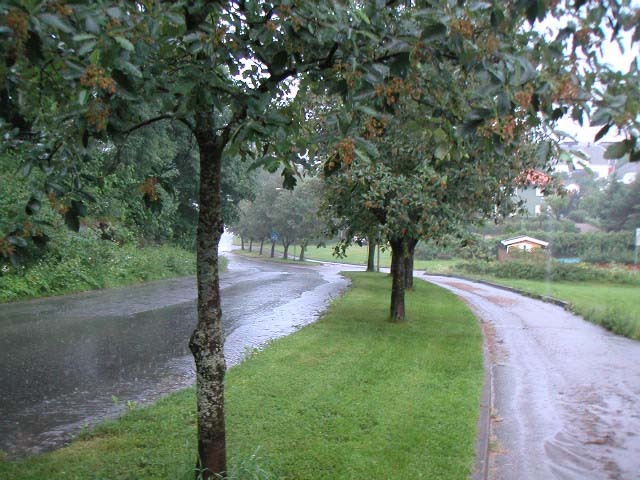 On the way to work, It still rains. The road is like a stream. So that, my shoes and jeans got wet when I reached my office. 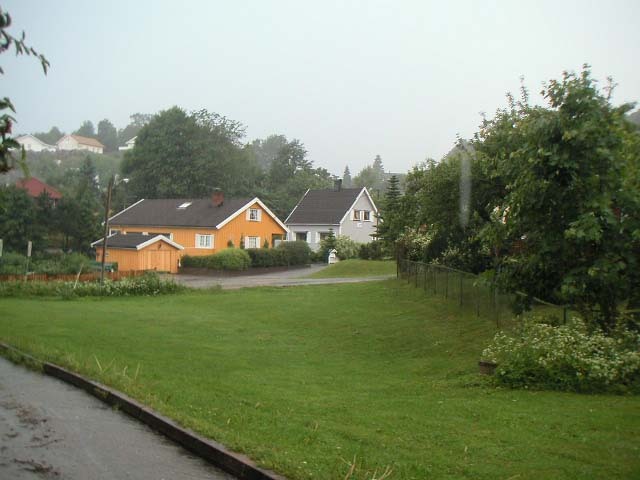 But, when I finished my job and returned home, it stopped raining. 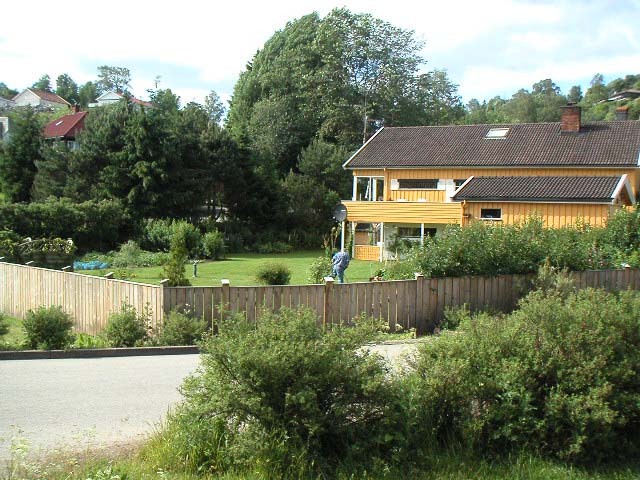 It is a little difficult to see in the picture, there is a man who takes care of his garden. The gardens in this town are well-kept. I feel their doggedness. 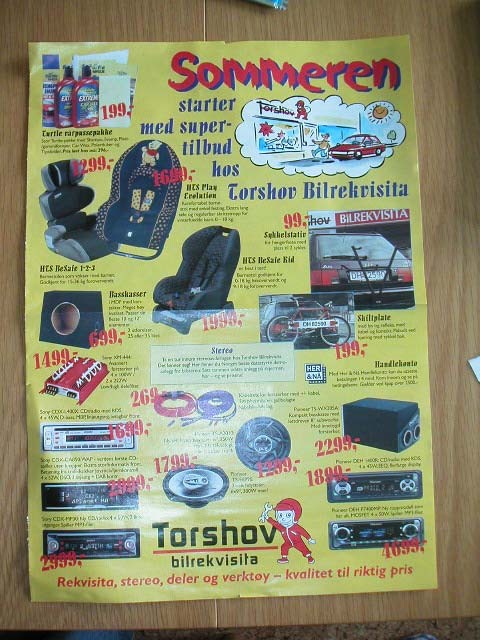 Anyway, I introduce a newspaper and its advertising leaflets today. 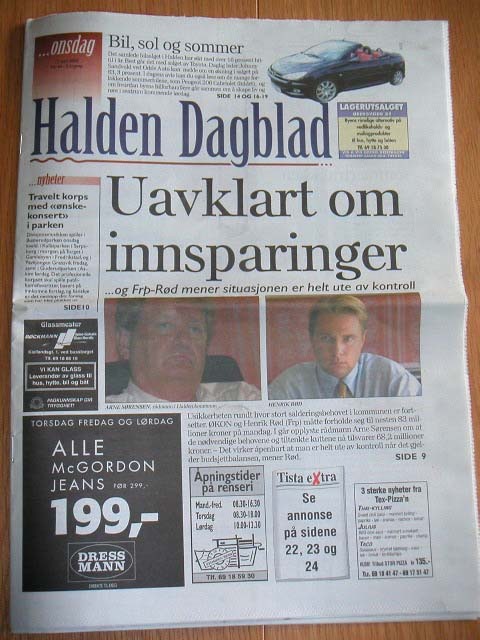 I am NEVER suffering from lack of article. 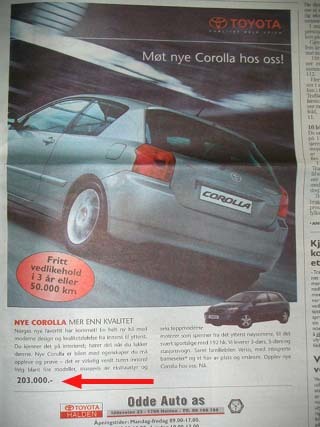 there is the advertisement of TOYOTA COROLLA. 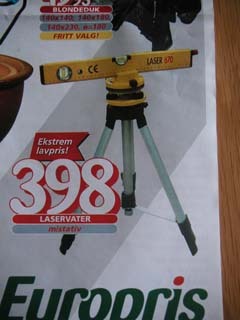 The price is 203,000Kr. More than 3 million Yen! 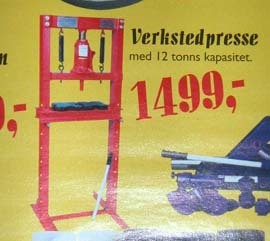 (1Kr.=16 Yen) Really? 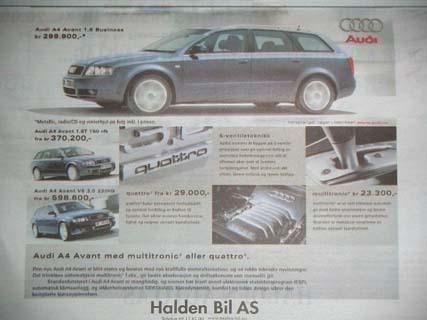 There is the advertisement of Audi, too. 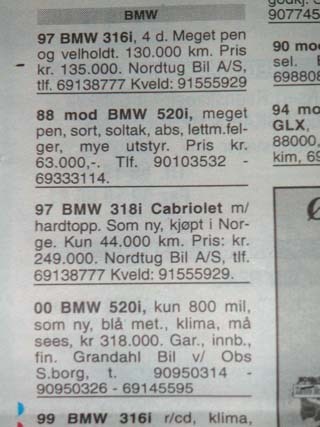 The cheapest one, A4 Avant business costs 299,000Kr. 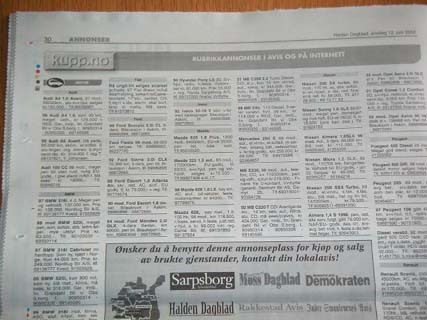 In the newspaper, there are personal announcements which cars and motorbikes are sold. 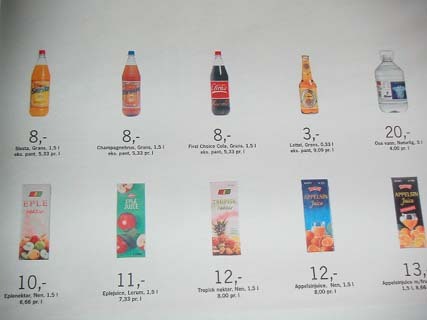 They are categorized according to the manufacturers. By the way, BMW is like this. 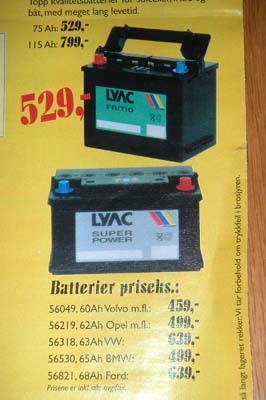 The price of 520i made in '88 is 63,000Kr. 1 million Yen? What? 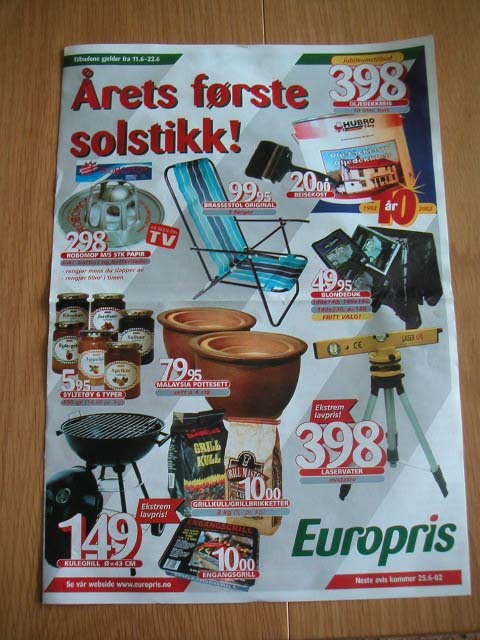 In the newspaper, there are some advertising leaflets. 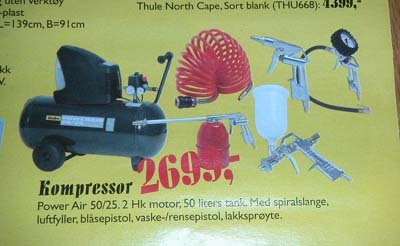 This is that of car equipment. 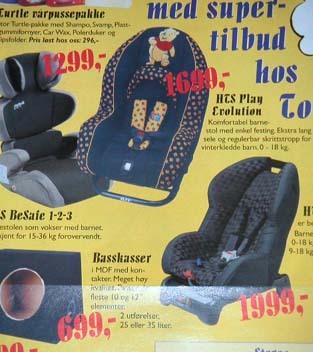 Child seats are for sale..
Engine lifter is also sold. 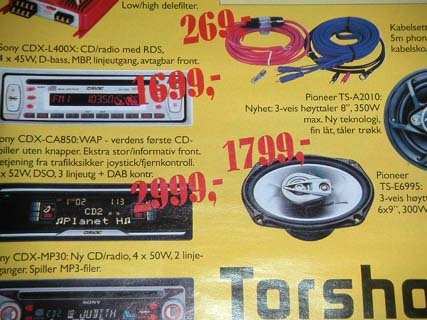 Car audios are for sale, too. Relatively expensive. 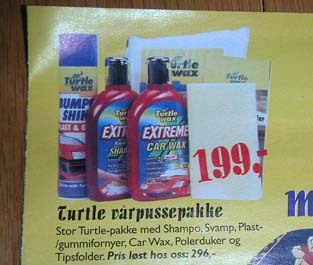 A wax set of Turtle is also sold. 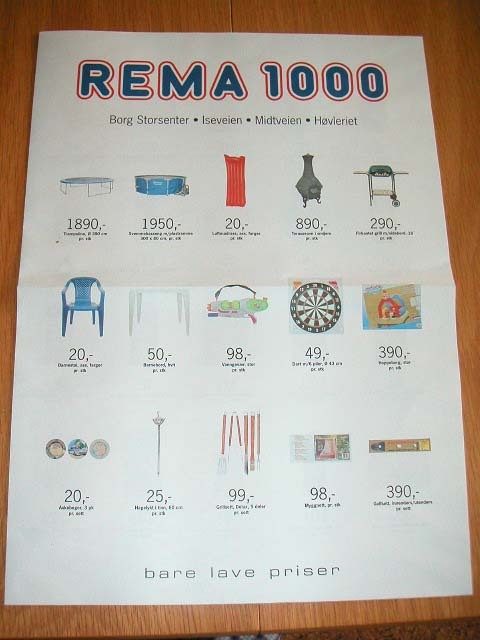 This is a leaflet of a discount shop. 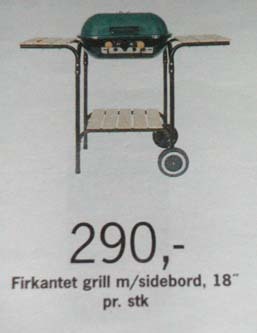 BBQ grill and charcoal is also for sale. These are really cheap. 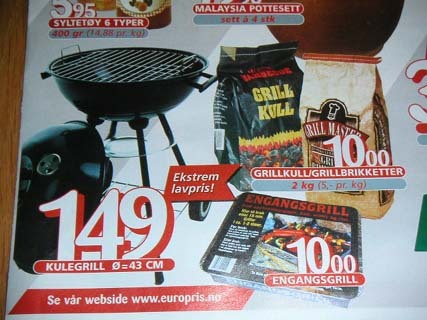 The charcoal of 2kg costs 10Kr. 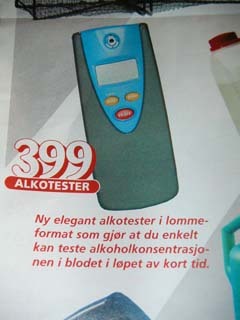 There is an alcohol tester. Drink and drive is prohibited in every countries. 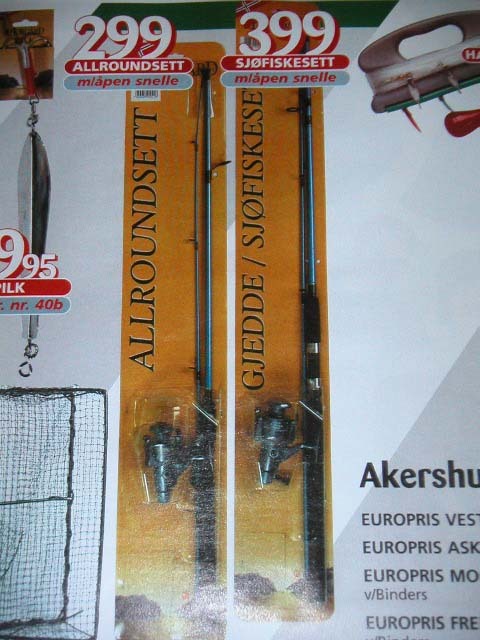 Fishing rods with reels are for sale, too. Fishing is popular here. 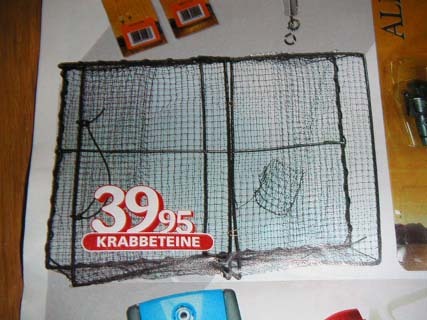 Is this a fishing trap? Is this O.K. here? 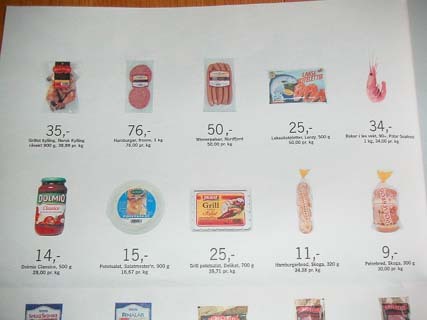 This is the leaflet for a supermarket. 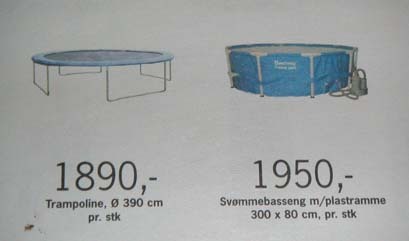 It is natural that trampolines and simple swimming pools are for sale in the supermarket. This grill looks convenient. It has sideboards. 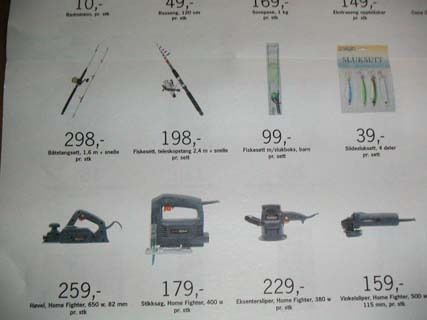 Of course, fishing rods and electric tools are for sale. Jeez? 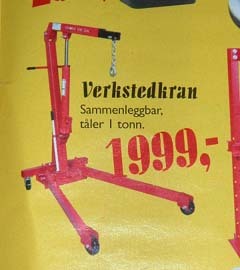 They are cheap! Foods are for sale because it's a supermarket. I have lots of leaflets else I want to introduce. But I keep them for the time when I can find nothing to write.